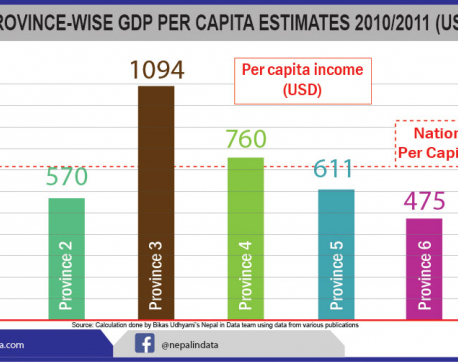 POKHARA, June 8: Province 4 has set its target of increasing the per capita income of its denizens to US$ 2500. This would result in the reduction of number of people living below poverty line from 14.2 % to 7 %. On Friday, Chief Minister Babu Ram Kunwar revealed such programs for the upcoming fiscal year during a meeting of the provincial assembly. Similarly, the province has plans to double the agriculture tax, start the work of national pride projects such as Korala-Pokhara and Pokhara-Dumkibas fast tracks, establish an international multidimensional conference center in the province and also the construction of a large stadium. The provincial government has reiterated its commitment of establishing lungs, kidney and cancer hospital, to complete Pokhara Regional Airport within three years, to welcome 2 million tourists by 2022, construct a monorail track to connect Fewa, Begnas and Rupa lakes, among others. Likewise, the province will be establishing an Information Technology (IT) Park and will make broadband network accessible in all local units. Budget will be invested in the production of energy by involving the private sector. Distributing clean drinking water in the whole province, improving health and education sectors are other major targets set by the government. In the next two years, the provincial government aims to create an environment for employment of 50,000 locals and self-employment of 100,000 people. Tourism, energy, agriculture, industry and physical infrastructure have been considered as the five pillars for the development of the province. The provincial government has given special emphasis on tourism promotion, organic production, animal husbandry, herbal farming. Furthermore, skill generating and capacity building trainings will be conducted to create enough manpower in the province. Province 4 has formulated a policy to develop Kaligandaki and Marsyangdi corridors and economic corridors. Besides that, 'forest for prosperity' program will be launched to maintain 40 % forest area in the province. Likewise, construction of herb processing center, water resource conservation area, green park are among other plans. In addition to that, construction of a satellite city, martyrs memorial park and operation of electric vehicles are also in the list. The province has planned to implement and execute all these programs and policies by seeking internal loan, tax collection, and foreign investment. Caption: Governor of Province 4 Babu Ram Kunwar publicizing the programs and policies for the upcoming fiscal year.